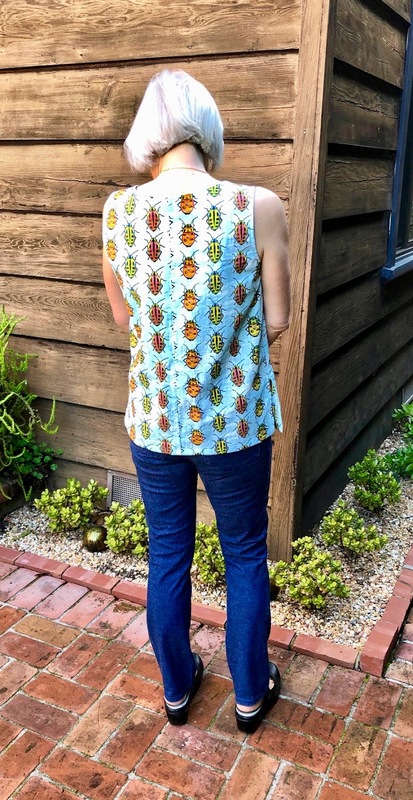 I didn't actually set out to make myself a beetle top. I bought this fabric at Britex last year with my grandson in mind. 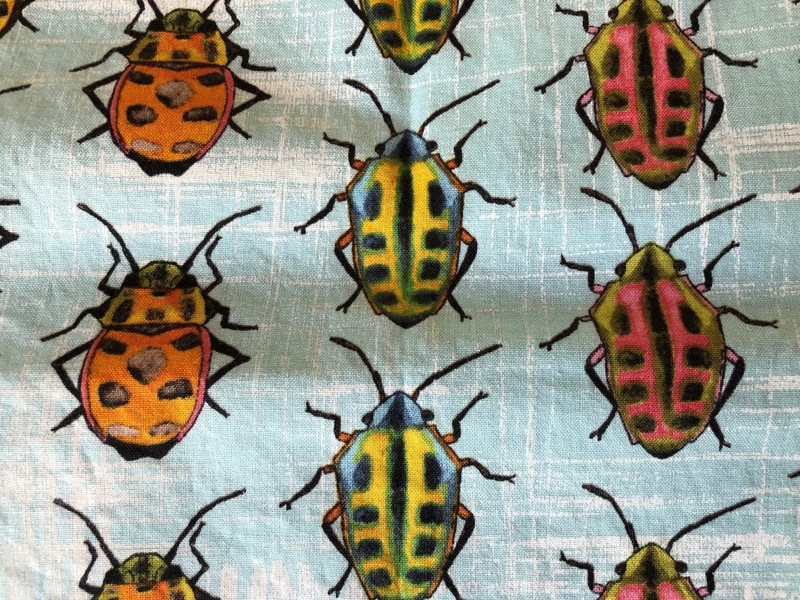 What could be cuter than a little set of overalls covered with beetles? I could call them his Love Bug pants. As it turns out, though, the kid's style is more Grandpa Chic than Quirky/Cute. Even at 18 months he wears a lot of bermuda shorts and cardigans. Think Mr. Rogers, but way shorter. 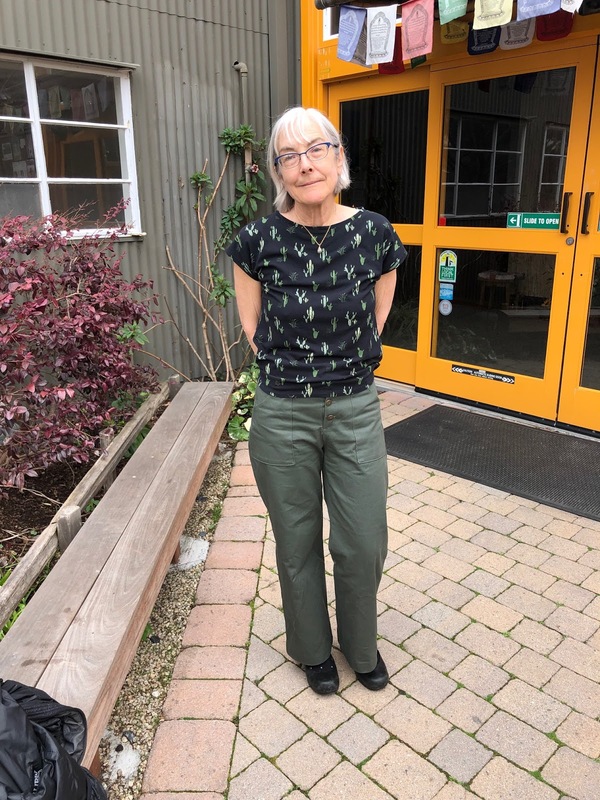 So one day last week I decided, "Hey Ho, someone has to be the grandma who wears weird print tops, and it looks like I'm elected." 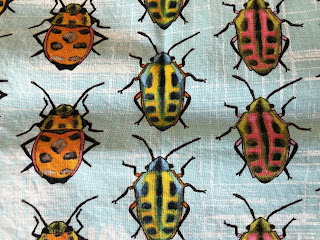 They look a bit like polka dots from a distance, but when you see them up close they're definitely beetles. I only had a yard of this fabric, so I pulled out my old reliable, McCall's 8050. I think it's out of print, but it's pretty recent (1996), so it's not too hard to come by. Hmm, just realized that 1996 is 23 years ago. Time just telescopes more and more as I get older. Anyway, this is the first time I've tried the sleeveless version of this pattern and I like it pretty well. I like the square-ish neckline and I very much like not having to set in the sleeves. The last time I made the sleeved version I swore I would never set in a sleeve again as long as I lived. The pattern includes facings for the neck and arm scythe. I did use the neck facing, which I think gives a nice finish. I nixed the arm scythe facings in favor of a bias tape finish, which will be much easier to wear. I hate it when facings try to pop out at the underarm, as they always seem to do on sleeveless tops. I'm thinking this top will be a hit with my grandson, though he would never wear such a thing himself. There's nothing funnier than a grandma in a novelty print top. My pattern review is on PatternReview.com here. I was cruising through Stone Mountain fabrics when I saw it. They had a sample of the Sapporo Coat made up in linen. It was unlined, with contrasting hong kong finish inside. I wanted that coat, and I wanted it bad. I really liked the way the pockets were set into those curved front seams. I liked the swagger of the oversized, cocoon shaping. And I liked that it looked pretty straightforward to sew; no tailoring, no darts, no closures. So I bought the pattern right then and there. And I'm glad I did, even though it's the most expensive pattern I've ever purchased. Papercut notes that the envelope model is 5/10". That's about 8 inches taller than me, so I was expecting the finished coat to be pretty long, loose and swingy. Which it is. And I think I like it. It makes me feel jaunty and debonair. 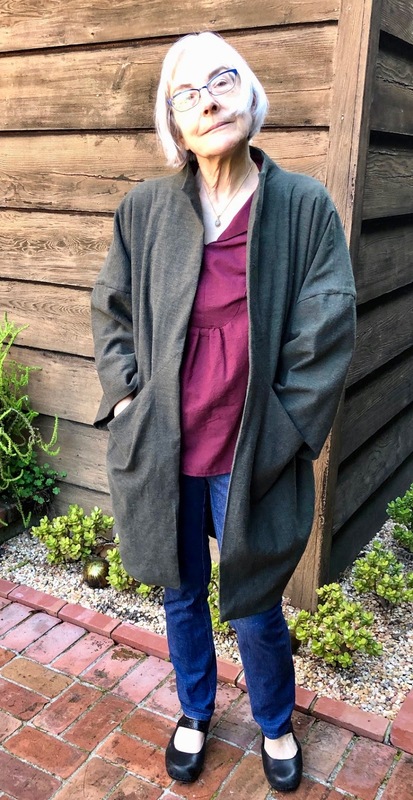 I do need to wear this coat over a slim fit under layer though, or I risk looking too much like Yoda. There are three sizes: XXS/XS, S/M, and L/XL. I cut the smallest size. It was a totally problem-free project. I love those. The pattern instructions are good, and everything fits together well. Even the lining went in easily for me, and this is only the second time I've ever lined anything. I used a brushed cotton twill in a kind of a dark olive green from Hart's. I used a lighter olive green flannel for the lining. Smitten as I was with those hong kong seams, I didn't want to have to actually apply them, especially on those curved pocket pieces. 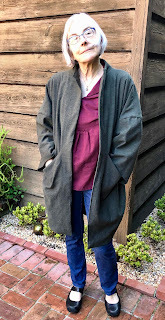 Plus, I thought the twill outer shell combined with a flannel lining would give the coat enough heft to see me through our winter season. Here on the Central Coast, that means temps in the mid-50s. The pattern calls for 3 yards of 55" wide fabric and it really does use it all, even in the smallest size. Those pieces are big and oddly shaped. I was able to cut everything out with the fabric folded though. This pattern was so fun to sew that I really want to make another one right away. I probably don't need a stable of cocoon coats though. The Man is already slightly alarmed at how little space there is for him in our coat closet. Maybe just one more in a large scale print. Unlined, to toss on over a sleeveless shell in the summer for a bit of sun protection. Every so often I cough up a knitted finished object. 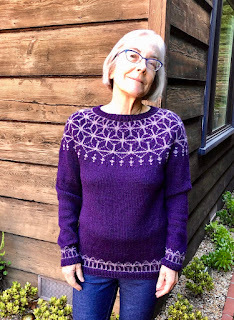 This is the Tensho Pullover, by Beatrice Perron. I hear that stranded yoke sweaters are having a moment in the knitting world. No wonder too, because they're fun to make. I used Cascade 220 in Amathyst and Dark Purple. 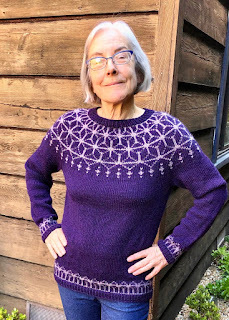 It's been more than 45 years since I've knit one of these bottom-up, in-the-round yoked sweaters. 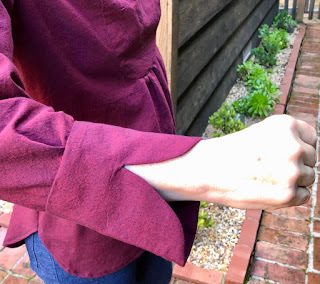 It's very satisfying because you slog along through the sleeves and body and then join them up and start decreasing around the yoke like there's no tomorrow. 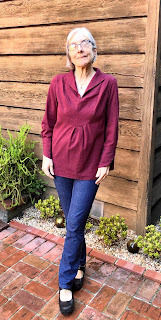 You can go from three disjointed pieces to a finished sweater in what feels like no time. When I got to the neck I was a bit flummoxed though. I tried it on before adding the neck band and the shoulders wanted to pop up awkwardly, like pigs ears. I was tempted to add another round or two of decreases to bring in the neckline. Luckily, before I got to work I tugged it down forcefully in a fit of frustration and, voila, a boat neck appeared! 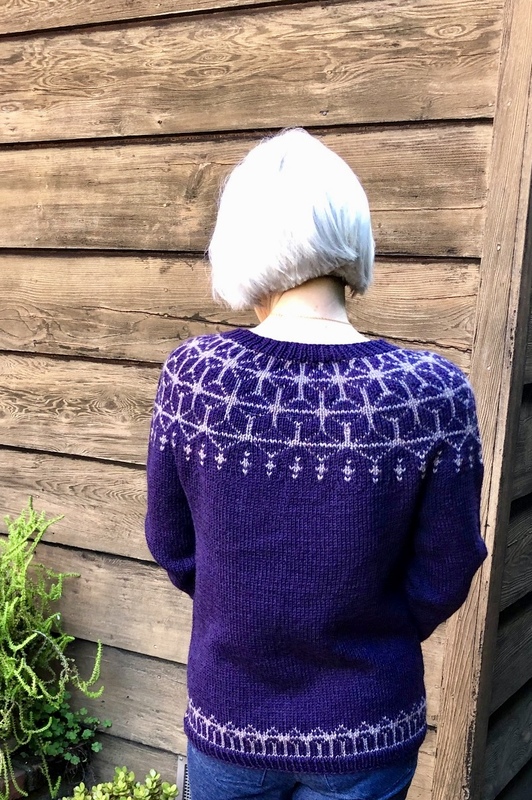 Then I vaguely remembered that these stranded yoke sweaters can pull in a bit at the top, especially if your tension for the color work isn't as even as it should be (cough cough). So I followed the pattern instructions for the neckline and did an aggressive blocking. Problem solved. 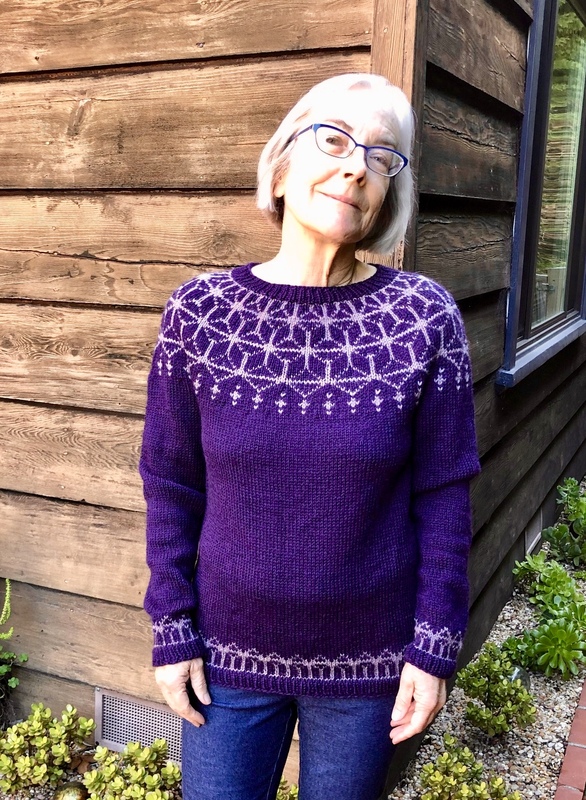 As usual, I finished this wool sweater just as we're cruising into summer. 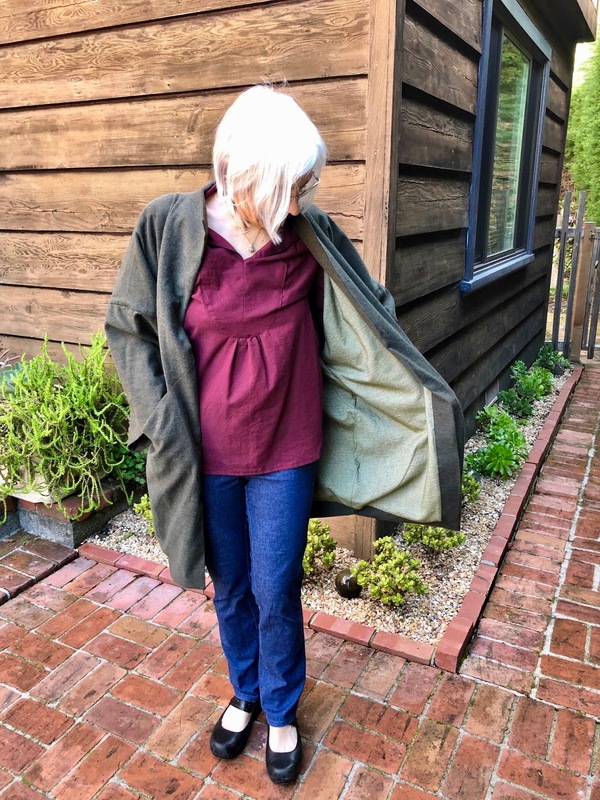 I'll probably be able to squeeze in a few wearings while we're in our June Gloom season; that's when it's foggy until lunchtime, sunny for two hours and then foggy again by mid-afternoon. And I know I'll appreciate wearing it again round about Thanksgiving. If you're in the market for a yoked color work sweater, this is a nice pattern that's easy to follow and works up quickly. My Ravelry notes, such as they are, are here. I went on a Girl's Night Out with a friend up in the Bay Area recently. 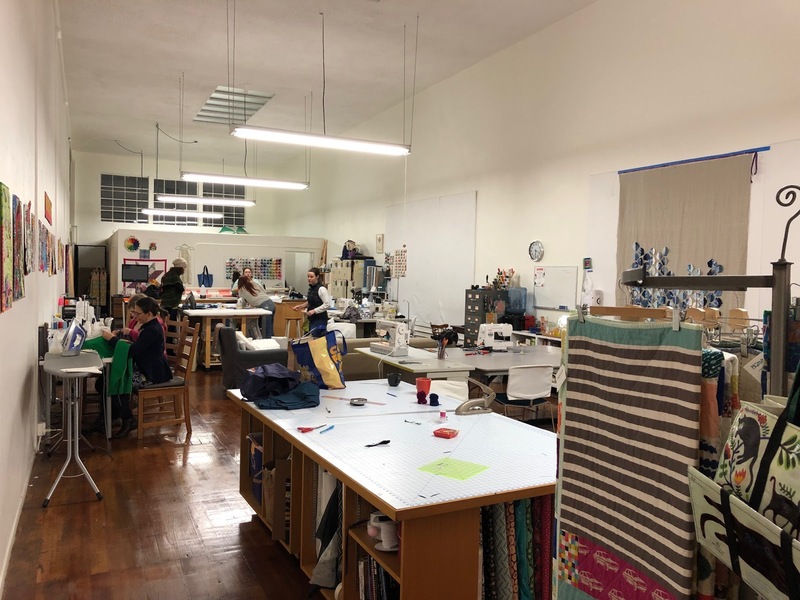 We took the opportunity to stop by some of our favorite crafting destinations, including A Verb for Keeping Warm in Oakland. 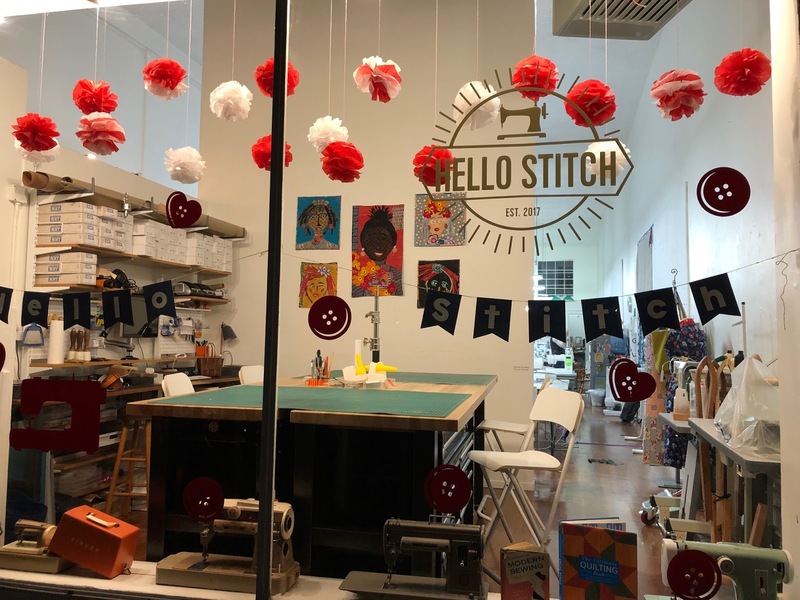 I believe they started out as a knitting emporium but they've added some very nice fabrics, as well as a few sewing patterns. We went through the store like a whirlwind because our parking meter was about to run out and we'd already gotten one $60 parking ticket that morning. I tried on a sample of one of their patterns, the Nell tunic. It's not my usual style, but I kind of fell in love with it. So I bought a copy, even though it's pricier than most of my pattern purchases. And here it is, made up in a Kaffe Fassett shot cotton. It's like a flashback to the poetry-and-flowers-in-the-field hippie days of my youth. I so want to buy a bunch of embroidery floss and go to town on that yoke. The pattern sizing is kind of non-standard. They list the sizes by finished measurements, ranging from a 37" bust to a 47" bust and recommend 4-6 inches of wearing ease. I made up the smallest size for my 35ish inch bust, so I'm sporting a closer fit than advised. But it's comfortable to wear and easy enough to pull off and on, so I'm happy. The pattern has a couple of details that kick it up a notch from your basic tunic. During construction I noticed that the yoke front includes some princess seam shaping so that the fit isn't quite as blousey and overwhelming as tunics can sometimes be. There's also a cute curved notch detail on the back neck and cuff. Those cuffs are a tempting canvas for embroidery too, don't you think? The gathers at the bottom of the front yoke give it a bit of a pregnant lady vibe. I think I'll try subbing in a couple small pleats for my next version. 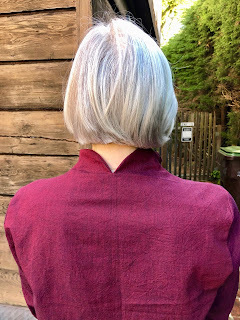 I'm on a continuing quest for go-to woven top patterns. The Nell might be among the contenders. I do want to make up another version for sure. I have some ikat cotton upstairs from my Indonesian bonanza from Molly's mom. I'll try draping that on my Mini Me to see if it works. My pattern review is on PaternReview.com here. 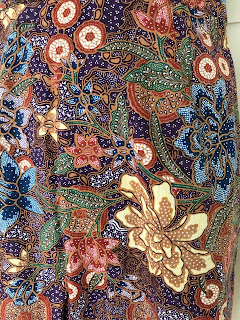 Last year my friend, Molly, gifted me with some lovely batik fabrics that her mother had brought back from Indonesia decades ago. She also asked me if I could possibly make her a walking skirt out of one of the pieces that was her favorite. I said "Sure!," and then dragged the project out for an unconscionable time because I was too nervous about cutting into this beautiful and beloved fabric. Increasing my fears, the fabric was just 2 yards long and maybe 36 inches wide. No fudge room at all if I messed something up. Cue shallow, panicked breathing. 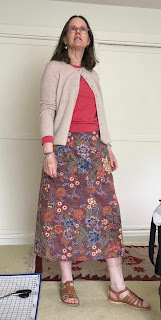 I used my favorite skirt pattern, BurdaStyle skirt #119 from the October, 2011 issue. I just love this skirt. The fit is slim but comfortable, the waistband has a nice curve and the pockets are all that and a bag of chips. 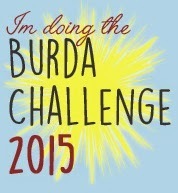 It's available for download on the BurdaStyle site, if you're tempted. 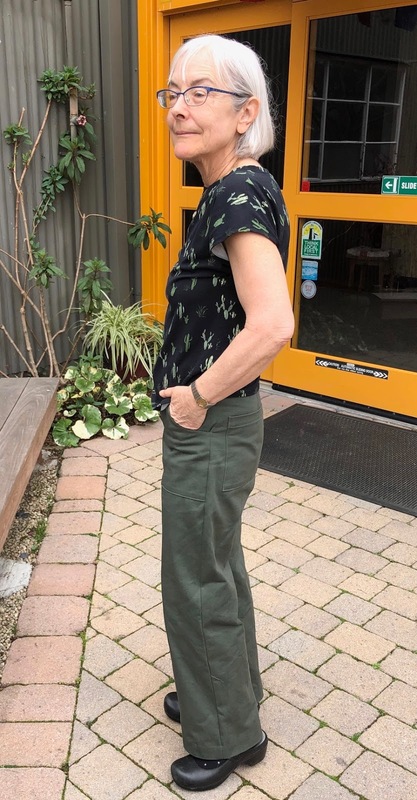 This time I cut the front on the fold and swapped the pockets out for inseam pockets, so as to minimize breakup of those fabulous jungle flowers. And moved the zip to the back, so I didn't have to mess with pockets and zip in the same seam. 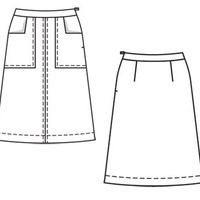 I also lengthened, because Molly likes her skirts on the longer side. Molly's shape is pretty different from mine. She is more of a classic hourglass, whereas I am a straight up brick. I traced a new version of the pattern sized for her and made up a muslin out of an old sheet so she could see if this style would work. She gave it the thumbs up, and then it sat. For months. Eventually The Man pointed out that the fabric wasn't doing Molly any good sitting folded up in my fabric closet, so I took a deep breath and got to work with the fabric scissors. And here are the results! I didn't have enough fabric to fiddle with pattern placement, so it's sheer luck that none of those flowers ended up in the wrong spot (if you know what I mean). It's been too rainy here on the Central Coast for Molly to give the skirt a real road test, but she thinks it will meet her needs. 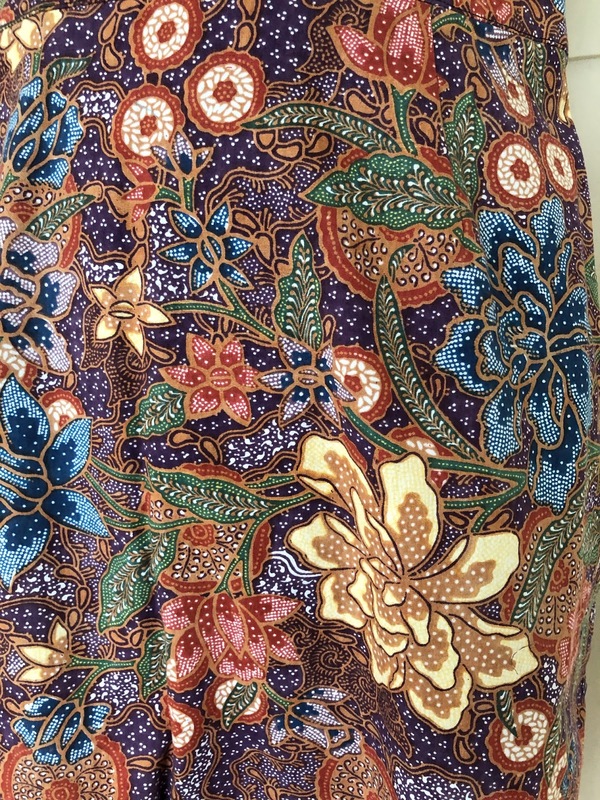 I have fabric lined up for two more of these skirts for myself. They really are very easy to wear, and those pockets are the bomb. My original pattern review is on PatternReview.com here. 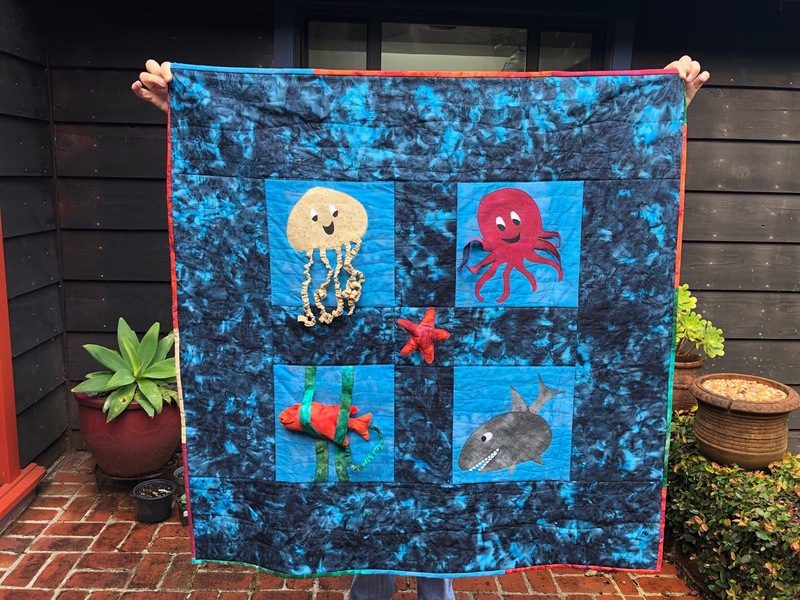 I made an Under the Sea quilt for my granddaughter, pretty much on a whim. She's just about 6 months old now, and right at that stage where she wants to grab everything and put it in her mouth. I wanted to make her a quilt that had things going on; tentacles to boing, contractile arms to pet, and teeth to poke. I think they call them "activity quilts." I made a sketch of the design some months ago, but I couldn't figure out a good way to get all those moving parts installed. 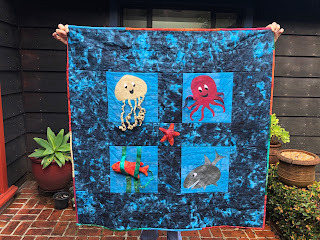 Then I stumbled on a Bluprint class called "Cute Quilt-As-You-Go Applique Monsters," taught by Wendi Gratz, and all my questions were answered. Et voila! Once I had some guidance on technique it was all pretty quick to do. 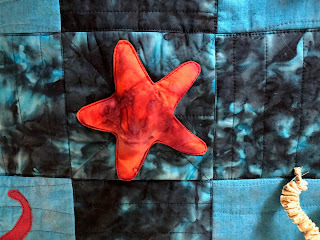 Wendi Gratz has you quilt the individual squares, then use HeatnBond and a hot iron to fuse your little bits to the surface. Then you just stitch around the edges and Bob's your uncle. 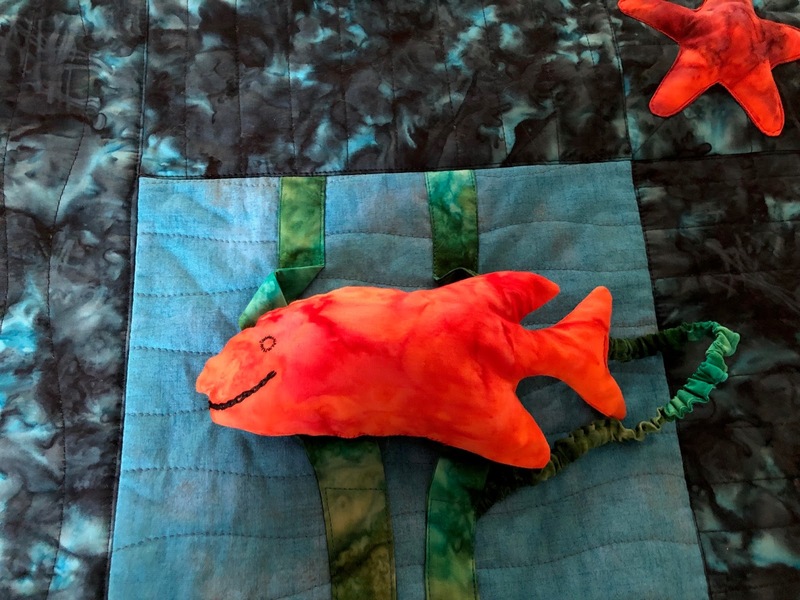 She says she's made quilts for her daughter that have been washed 300 times and everything holds together just fine. 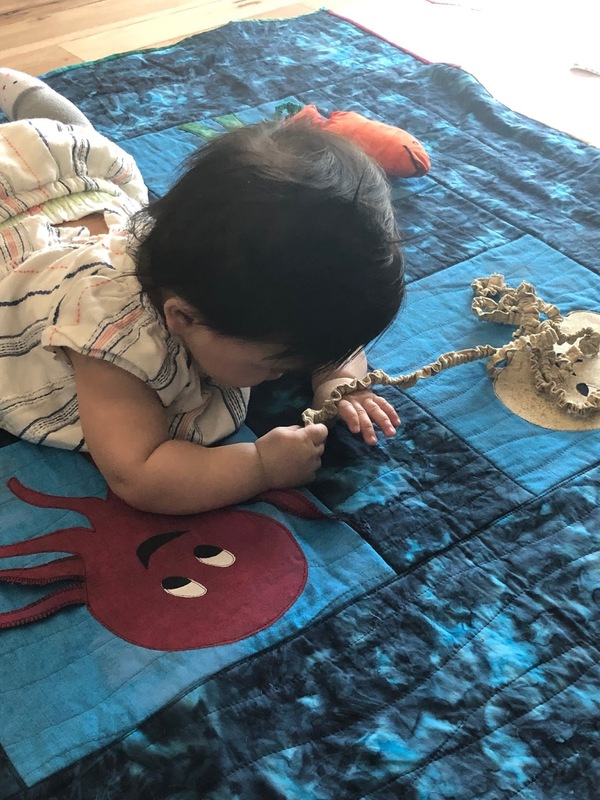 We shall see, because my granddaughter and her co-conspirator (her big brother) and sure to spill things on it daily. Character #1 is a shark. 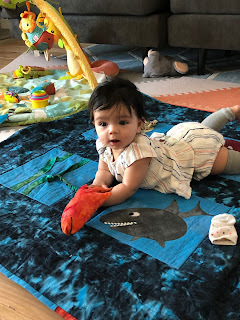 There's a viral video called Baby Shark that both kids love; very catchy tune. 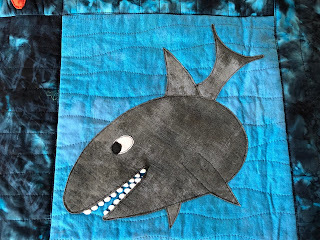 So I had to include a shark. I used some little bobble trim for the teeth. 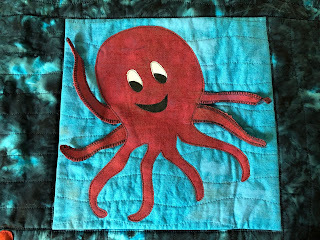 Character #2 is an octopus. Four of the arms swing free and they have minky on the back side, so they're kind of fun to finger. I tried to find something for the back that would be like suckers, but no dice. Character #3 is a jellyfish. There's a narrow elastic in each of the tentacles, so you can pull them out and they boing back. Character #4 was the last one I came up with. It was going to be a clown fish, but I couldn't find any good clown fish fabric. 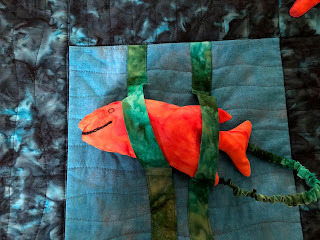 I did see some orange batik that I liked, so instead he's a Garibaldi fish. That's the California State marine fish, in case you're wondering. Normally he hides in the kelp, but you can take him out and boing him around on his elastic if you want to. 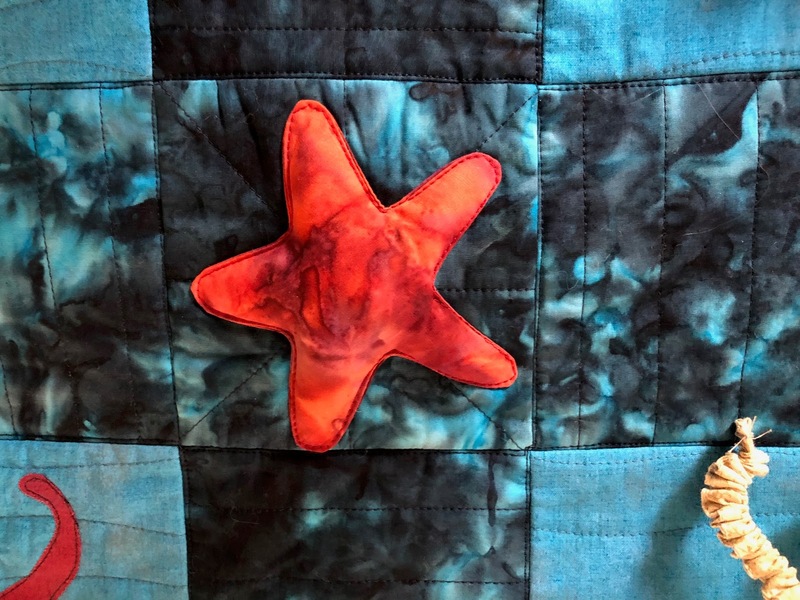 In the center there's a starfish that's stuffed with a little bit of batting to make her 3D. This was a really fun project to do. The actual sewing only took a couple of days. 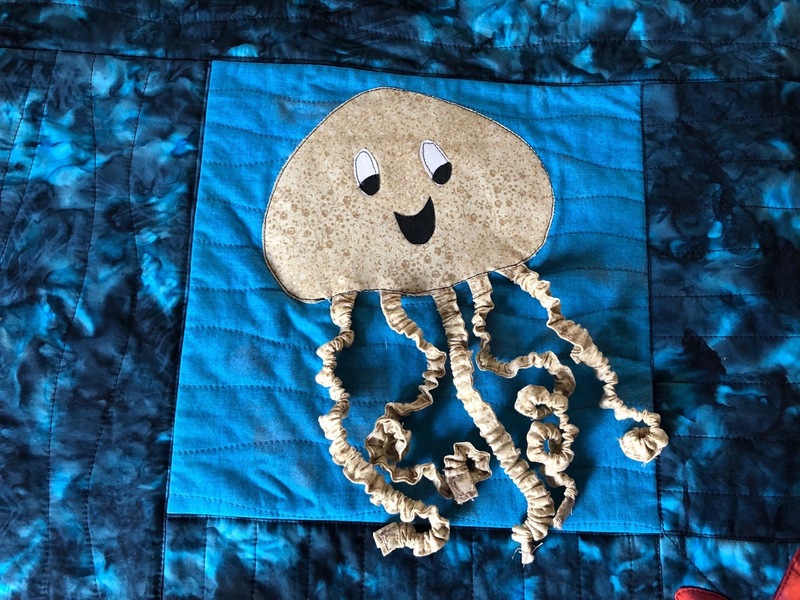 I spent longer trying to get that danged elastic inside the jellyfish tentacles than on anything else. I ended up finishing and turning the fabric tubes and then threading the elastic through with a darning needle. My granddaughter gave the quilt a workout during my visit last weekend. She went right for the tentacles, as I would have done myself. 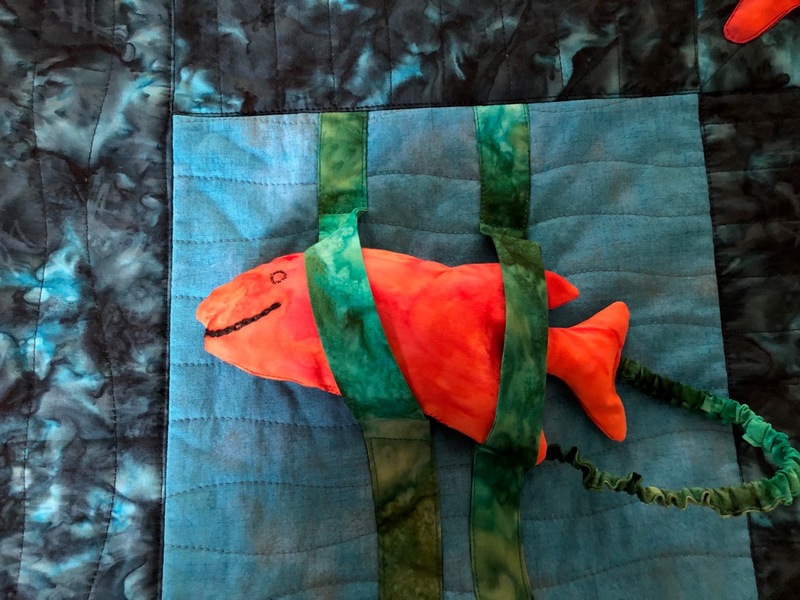 Plus, she figured out how to get the Garibaldi fish out of the kelp in mere moments. I think she is a genius. I was a happy Craftsy user for quite some time. I tried to resist buying a Bluprint subscription for months. I worry that it's going to become just another streaming TV station and go over to the advertising dark side. They finally offered me such a good rate that I buckled and joined for a year. And it's been good so far. 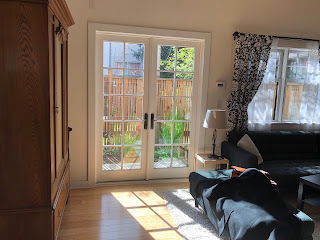 I've watched classes that I probably wouldn't have purchased under the old Craftsy model and I've enjoyed some of them very much. This class is one of those serendipitous finds. If you have any kids in your life who might enjoy a tactile quilt, I recommend it! Actually, this style of quilt would be fun to do for an adult if you use less childish imagery. My friend Martha and I were saying I should make an anvil quilt for The Man. He's heavy into anvils at the moment, and they have distinctive silhouettes that would lent themselves to this sort of thing. Hmmm. Whew! We're just coming off a rush of travel and house guests. 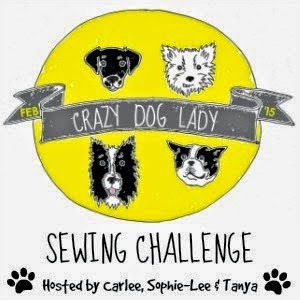 All very fun, but it's cut into my sewing and blogging time. So, better late than never, here are some pictures from the Make the Lander Pants class that I took back in February with my friend, Jessica. 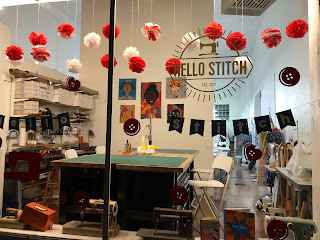 The class took place at Hello Stitch sewing studio in Berkeley, CA., We had a blast. I should have taken more photos, but the day was such a blur of activity that I didn't think of it until we were heading out in the evening. The studio space is large and light and there are plenty of tables and equipment and space. The class was capped at 7 people (if I remember right), so we all got a fair share of our teacher's time. That teacher was Beth Gavin, who blogs at SunnyGal Studio. She kept us on point. Pretty much everyone walked out with a close-to-complete pair of pants, even though some of us were changing up the construction by subbing zip flys for the buttons and slash pockets for the patches. It's fun to see a bunch of different people sewing up the same pattern. Gives you great ideas for next time. Since we were making a 70 mile drive to attend the class, we decided to treat ourselves to a Girl's Night Out in Berkeley. 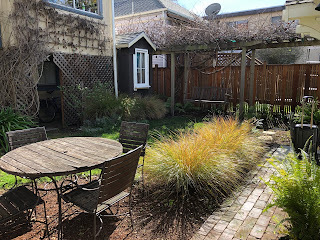 We stayed at a very cute AirBnB just a mile from the class location. Too bad the weather was rainy, or we would have taken advantage of the garden table to sip our morning coffee. All in all a very fun get away. 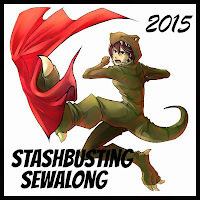 There's nothing like social sewing. So, on to the pants. I've been a bit smitten with this pattern ever since it first came out. It's totally got the zeitgeist of the pants of my youth. Which, I admit, was in the 70's. We used to buy those pants at the Army Navy Surplus store on University Avenue in Berkeley. They came in blue denim and railroad denim. Gee, I loved those pants. And, thanks to the wonders of sewing, I can wear them once again! I used Santa Cruz Twill from Hart's. The pattern called for almost 3 yards. Since I'm a short person, I think I have enough left for a skirt. 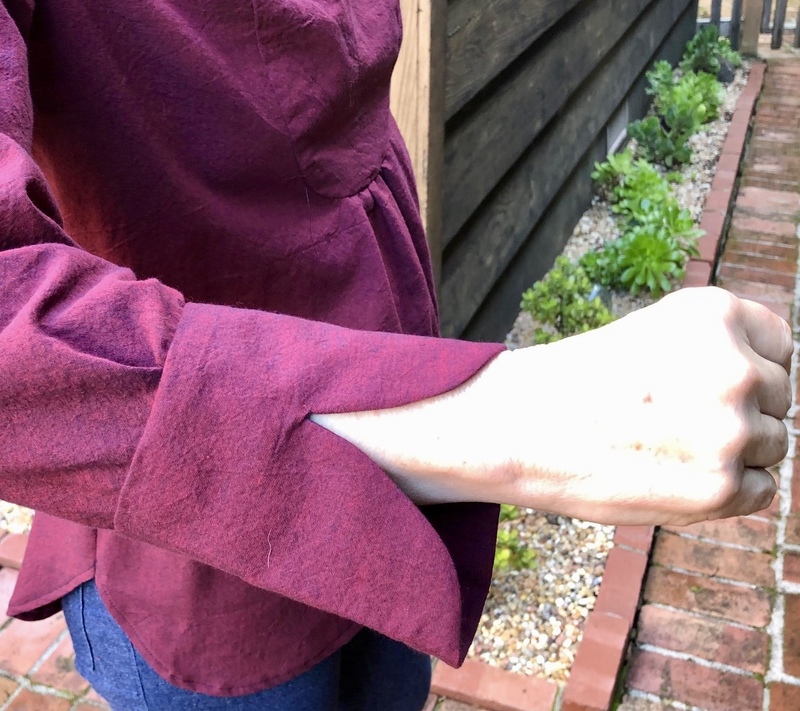 I made the full-on button-front fly and patch pocket version and I like them a lot. They're comfortable to wear and straightforward to sew. I also love the pockets. Here's a button fly closeup. 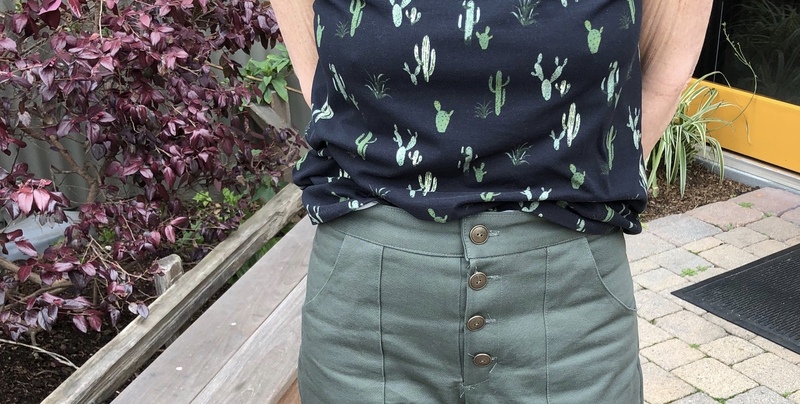 The top is a Kirsten Kimono Tee made from cactus fabric that turns out to be a good color match for these pants. The only change I'll make next time is to swap out the straight waistband for a curved one. The straight band gapes a bit on me, even though I am pretty darn straight myself. I've already bought some railroad stripe denim to make myself another pair of these pants. Now all I need to relive my high school days is a chambray work shirt and some hiking boots. Because who doesn't love dogs?